Twenty five ago, HETS began a journey of innovation in Higher Education, thanks to the involvement and aspirations of a significant group of members highly committed to the vision of the organization. Members themselves embarked on a journey towards enhanced opportunities in higher education. Right from the beginning, our members knew it was possible to transform higher education and open up a world of possibilities for students through technology innovation. This group of visionaries acknowledged the value of technology as a means to reach their institutional goals and gathered to dynamically propose and guide strategies toward this end. The initial purpose of the HETS Consortium back in 1993 was to seek funds that would enable the affiliated institutions to share courses through telecommunications and video-conferences. In 1995, the organization received a grant from the U.S. Department of Commerce for nine member institutions to establish electronic classrooms with satellite connections to share their academic offerings at-a-distance. 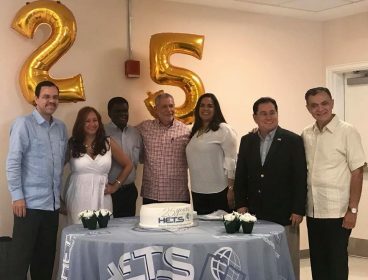 HETS has initiated the festivities to celebrate its 25th Anniversary during the summer Board of Director’s Meeting held on July 12 and 13, 2018 at Bronx Community College of the City University of New York. Board members, Corporate partners, and special invitees gathered on a special luncheon celebration hosted by HETS Board of Directors, specially Dr. Thomas Isekenegbe, President of Bronx Community College. As part of the celebration events; President Isekenegbe, and Vice President Irene R. Delgado; took invitees to a brief tour of the campus, which is the first community college to hold the honor of being one of the national sites newly designated as a National Historic Landmark. During the tour, guests and attendees visited the Gould Memorial Library, the Hall of Fame of Greatest Americans, and the outstanding new library facilities on North Hall. After that, Board Members, and, special guests’ attendees enjoyed the luncheon where a video was shared to celebrate the first 25 Years of HETS history (access the link here). Dr. Carlos Vargas-Aburto, HETS Chair and President of Southeast Missouri State University; Dr. Antonio Pérez, President of Borough of Manhattan Community College, and Ms. Yubelkys Montalvo, HETS Executive Director presented the ceremony speeches’ before cutting the celebration cake. HETS 25th Anniversary celebrations will extend during next academic year until the Winter Board Meeting in Puerto Rico on February 2019. Watch here a part of Dr. Antonio Pérez Speech during the HETS 25th anniversary celebration at Bronx Community College.